DEXY CORP_ have been erecting the dark and bleak dystopia centred in mythical city of ‘Uchronopolis’ plagued by the dictate and oppression of tyrannical corporation-run government with its archetypal resistance figures and the resulting struggle, blending cinematic influences such as Brazil, V for Vendetta but also remindful of Equilibrium - or Japanese science fiction films and graphic novels, and literature classic as Orwell’s 1984, A Clockwork Orange by Anthony Burgess and other dystrophic greats come to mind too. ‘Uchronopolis’ is their second album and is promised as Darker vision and more empowered cyberpunk onslaught than its predecessor Fragments (2009). The thematic concept of the album feels very natural and is in many ways quite idealistic regardless of the hard industrial machine noise with the slaughter of guitars which offer it a contrast of sorts. Musically there is a lot of MINISTRY influence predominantly, SKINNY PUPPY tight second, NINE INCH NAILS to a lesser but not a negligible degree. I find myself questioning if these influences are not far too much audibly present and thinking that it’s difficult to explain their sound and not be describing one or the other of the three prototypes. Probably the tracks that show their own sound in uniqueness (or better assimilated influences) or broader scope are ‘Ex-Utero’, penultimate instrumental ‘Hyber-Nation’ and last song ‘Uchronopolis’ - more interesting and layered, also more atmospheric in the instrumental. Maybe in the next album they’ll shed some baggage of their influences, absorb them to a bigger degree to eliminate their dominance and get to the core of their very own distinctive mark more and deeper. 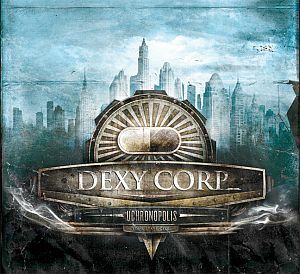 ‘Uchronopolis’ is a promising, good, invigorating album with interesting concept but it’s not quite the bull’s eye - yet.